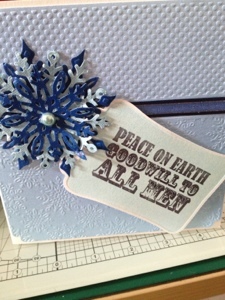 Well I am entering a 2nd card for this months embossing challenge. 6x6 Christmas elegance embossing folder. Dark blue ribbon and light blue pearl gem from my own stash. And the sentiment is from the Christmas magic Sentimentals rubber stamp set. Beautiful. Hope you feel better soon. Fabulous design and detail Sam. Gorgeous Embossing and a fabulous card. Lovely card - great embossing. Beautiful, love the soft blue, and the texture. A great winter-themed card! Love that snowflake. Thanks so much for playing with us at Crafter's Companion!